One drowsy summer’s day in 1984, teenage runaway Holly Sykes encounters a strange woman who offers a small kindness in exchange for ‘asylum’. Decades will pass before Holly understands exactly what sort of asylum the woman was seeking . . . 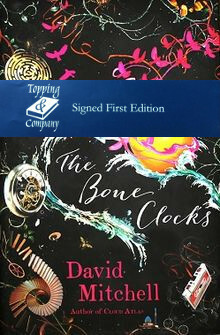 The Bone Clocks follows the twists and turns of Holly’s life from a scarred adolescence in Gravesend to old age on Ireland’s Atlantic coast as Europe’s oil supply dries up – a life not so far out of the ordinary, yet punctuated by flashes of precognition, visits from people who emerge from thin air and brief lapses in the laws of reality.